National Night Out is in Bohn Park Tonight! Tuesday, August 1 | 6 to 9 p.m.
Join local emergency personnel for the 2017 National Night Out event, taking place tonight, August 1, in Bohn Park! Kids (and adults) can get the chance to practice using a fire extinguisher and see what it’s like to use a real fire hose. 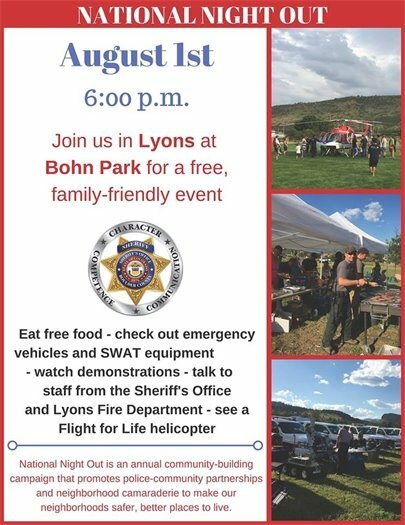 The event will also have a SWAT display, K9 team, a visit from Flight for Life, and FREE food, including hot dogs grilled up by the Lyons Area Fire Department! This free, family-friendly event is fun for all ages. See you at Bohn Park tonight! Boulder County Parks & Open Space and the Boulder County Sheriff’s Office Wildland Fire Management Program plan to conduct a prescribed burn at Ron Stewart Preserve at Rabbit Mountain beginning Wed., Aug. 2. The park will be closed completely during active ignition days. Specific areas will reopen as soon as it’s deemed safe to do so by fire personnel. The prescribed burn will cover approximately 36 acres and is located near the Eagle Wind Loop Trail. Additional acres may be burned at the preserve through Sept. 8. For more information and to sign up for update emails, go to BoulderCountyOpenSpace.org/burns or call (303) 678-6211. On Monday, Sheriff Joe Pelle rescinded the Stage 1 Fire Restrictions that were in place for western Boulder County. Residents are reminded that although the fire ban has been rescinded, there are still permit requirements in place for slash burning and broadcast burns, also known as prescribed fires. Agricultural burns and campfires are now allowed and do not require a permit.